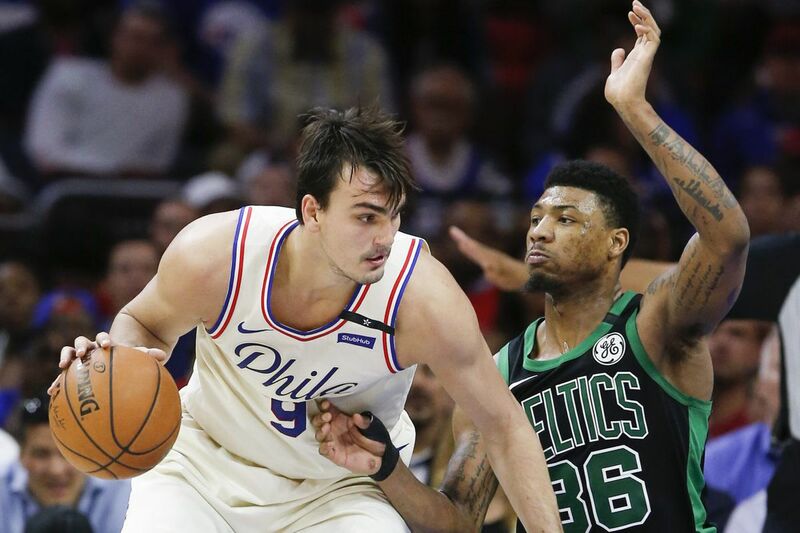 Sixers forward Dario Saric backs down Celtics’ guard Marcus Smart during the Sixers’ Game 3 loss on Monday. BOSTON — Dario Saric often flies under the radar when it comes to the praise the 76ers receive. With teammates like Ben Simmons and Joel Embiid, it's easy to understand why. For Celtics coach Brad Stevens, that is not the case. Saric has been on his radar since the regular season, and he proved in the Sixers' Game 4 win on Monday why he should be taken seriously. "He's a heck of a player, he's had a heck of a year, and he's been tough for everybody," Stevens said Tuesday. "Coming into the series, we thought he was probably their most unheralded guy." In Game 4, Saric led the Sixers with a game-high 25 points to go with eight rebounds, four assists, one block, one steal, and zero turnovers. That's a solid stat line by itself, but Saric was also at the center of some of the Celtics' biggest problems in the game. Rebounding has been a cornerstone of the Sixers' game all year, and they dominated the offensive glass, 16-6, in their 103-92 win, with Saric grabbing four. On three of those rebounds, Saric's extra effort led to second-chance points for the Sixers. "They were an outstanding offensive rebounding team coming into our series; that's a huge emphasis," Stevens said. "We have to do a better job of keeping the ball in front of us, we have to be more alert to their cutters, and we just have to make contact earlier. Easier said than done." Offensive rebounds lead to more possessions, often in the paint, and more possessions for the Sixers means that the Celtics are at a higher risk of racking up fouls, which has been the case in the last two games. By halftime on Monday, four of Boston's players had three fouls. "Obviously, that's two games in a row, so that's something we need to really be alert to," Stevens said. "There are things we think we can do better technically with being more prepared, being in a stance, being down and ready earlier, making contact earlier, those type of things. There's clearly some matchups that we'll look at." It would be easy to point to Embiid as the culprit for drawing fouls, since he is one of the league-leaders in that category. But, in Game 4, it was Saric who led the Sixers, accounting for seven of the Celtics' 28 fouls. Stevens said that he rarely takes his players out of the game because of foul trouble, but that's been different against the Sixers, in part because of the number of players they can post up and switch. The Sixers have limited the use of Amir Johnson in this series, electing to go with a smaller lineup featuring Saric and Ersan Ilyasova in the front court when Embiid is not on the floor. It's a lineup that has served the Sixers well. "That's a lineup that we worked quite a bit on heading into the series, because it was so effective prior to coming here and when Joel was out," he said. "Obviously, it's a very talented lineup, and a lineup that presents a lot of issues." The Sixers will look to continue causing issues for the Celtics in Game 5 on Wednesday night. Boston will try to contain Simmons and Embiid while dealing with the speed and pesky defensive of T.J. McConnell, who was inserted into the starting unit on Monday. In addition, Saric will be posting up, setting hard screens, flying out to the perimeter, battling for rebounds, and reminding the Celtics that he's not to be underestimated. "When people talk about all their youth, you start with Simmons and Embiid, for good reason — they're excellent, both incredibly talented, both very, very good players," Stevens said. "But when you've got another guy that early on in his career, like Dario, it's a pretty darn good foundation."